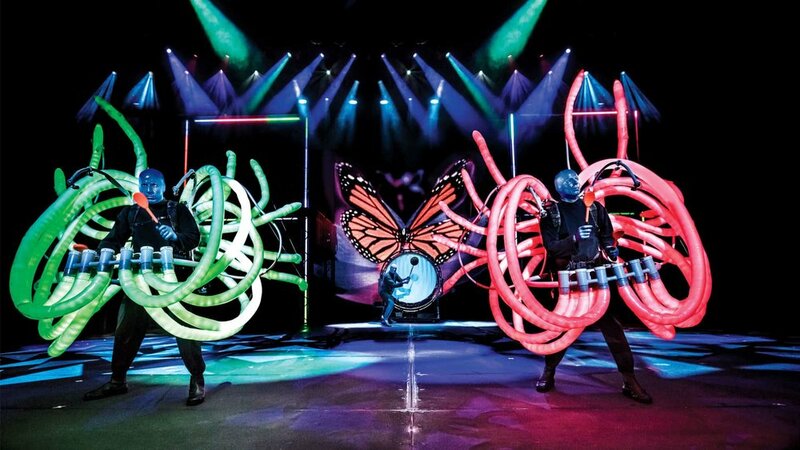 Blue Man Group is available for exclusive private events, as well as public shows. To inquire about pricing and availability of Blue Man Group, or to book Blue Man Group for your event, Contact Jay Siegan Presents here. Equal parts play, concert, and sketch routine, the Blue Man Group combined sight gags, physical stunts, and audience participation, with members of the front rows given plastic rain ponchos as protection from the hail of paint, food, and other assorted projectiles launched from the stage; in early 1991, they premiered their production Tubes at La MaMa, moving to the Astor Place Theater by the end of the year and ultimately winning an Obie Award for their efforts. Tubes eventually expanded to long runs in Boston, Chicago, and Las Vegas; in 1999, the Blue Man Group also issued an album, Audio, spotlighting their custom musical instruments. Three years later, the trio inked a multi-album deal with Atlantic's sister label, Lava Records. The Complex, which appeared in April 2003, marked the Blue Man Group's monumental sophomore album -- a slick effort showcasing impressive collaborations with Tracy Bonham, Dave Matthews, Dan the Automator, and Esthero. In 2008, the group celebrated its successful How to Be a Megastar tour by releasing a CD/DVD of the show as well as an EP of remixes of "Canta Conmigo," the successful Spanish-language interpretation of their song "Sing Along." Over the coming years, the Blue Man Group continued to expand its theatrical operations around the world, and in 2012, released an EP featuring various versions of their epic concert finale "Shake Your Euphemism." A new full-length album, Three, was released in 2016 to commemorate their 25th anniversary.